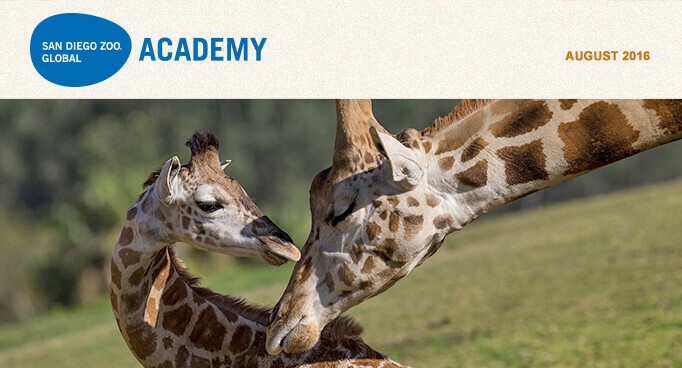 Keepers, interpreters, guides, and docents can explore the fascinating world of the world's tallest mammal as the San Diego Zoo Global Academy presents Giraffes, the newest module in Introducing Animals, our series about animal species and other taxonomic groups. The module explores the natural history and conservation of giraffes. Remarkable images show giraffes in ways you may never have seen before, and video provides insights into their behavior. The interactive module engages participants in the learning process, and questions at the end of each section help ensure that users master fundamental concepts before moving on to the next part. The Giraffes module takes about 60 minutes to complete, although participants can progress at their own pace and may repeat the entire course or sections of the course as many times as they like. The module can easily be integrated into your current training program. Providing online modules that team members can complete anywhere and at any time overcomes one of the major challenges of training: getting all participants together. 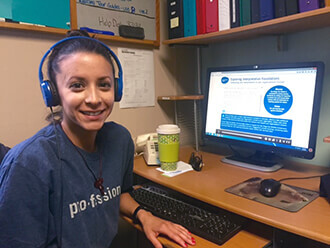 At the San Diego Zoo and Safari Park, participants complete online modules on their own before attending group training programs. They are able to master key vocabulary and concepts, giving them a solid foundation that allows them—and their trainers—to make the most of in-class and on-site training. 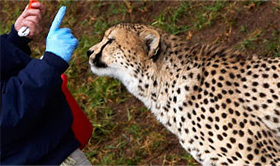 These modules are a great resource for interpreters, but they offer insights for veteran animal keepers, too—providing a bit of natural history that helps keepers address husbandry concerns. This module addresses common questions and provides an up-close exploration of what giraffes are all about. Whether you've worked with these animals for years, or you're a brand-new interpreter or docent, this module will give you a better understanding of these amazing animals. The Giraffes module joins Rhinoceroses, Elephants, Cats, Orangutans, Great Apes, Lions, Cheetahs, Polar Bears, Giant Pandas, Tigers, and Gorillas in the Introducing Animals series. Look for upcoming modules about Old World monkeys, lemurs, and penguins. Click here to view a sample of the Giraffes course. Learn more and make your plans to attend! The San Diego Zoo Global Academy will host a get-together during the Association of Zoos and Aquariums 2016 Annual Conference, on Saturday, September 10 from 7 to 9 p.m., at the Omni Hotel in downtown San Diego. Let's celebrate our industry's collaboration to provide online training! In addition to a great locale, food, and drinks, the evening will feature our Academy newsletter contributors Jim Gesualdi and Dr. Rob Jones, plus San Diego Zoo Global's Chief Human Resources Officer Tim Mulligan. 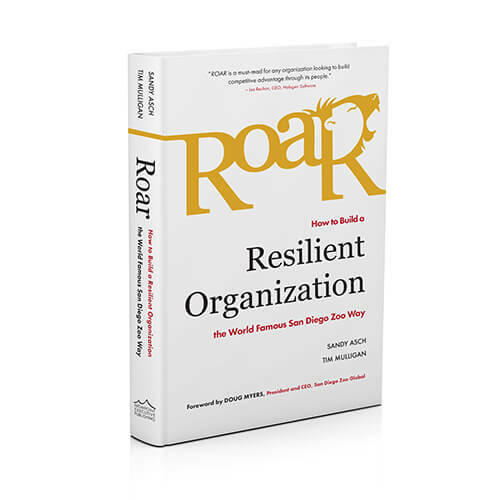 Attendees will receive a signed copy of Tim's best-selling book, ROAR: How To Build a Resilient Organization the World Famous San Diego Zoo Way. The San Diego Zoo Safari Park's Safari Experiences team members wear Academy T-shirts while taking online courses. Whether you're looking for an ideal gift (for yourself or someone else) or an incentive for your institution's training program, San Diego Zoo Academy T-shirts are a perfect fit. The Erie Zoo in Pennsylvania is part of the Academy's collaborative learning environment. Welcome! Please join us for the Administrator's Users Group Webinar, hosted by Academy partner CypherWorx. The next webinar is Wednesday, August 17 at 11 a.m. PDT. Ergonomics allows participants to obtain the skills and knowledge needed to anticipate, recognize, evaluate, and control ergonomic risk factors in a broad range of workplace settings. Participants will learn about ergonomics, OSHA guidelines, ergonomics stressors, common ergonomic injuries, and recommended solutions. Happy anniversary, baby. Got you on my mind. August 2016 marks the 50th anniversary of the U.S. Animal Welfare Act (AWA), which remains the United States' only comprehensive (yet limited) federal animal welfare law. Signed into law on August 24, 1966 by President Lyndon Baines Johnson, the AWA is more important today than ever, and it will play a vital role in the future of the zoological community. the humane ethic that animals should be accorded the basic creature comforts. Today, as our understanding about and compassion toward animals continues to evolve, longstanding criticisms of the AWA and its limitations remain. Those criticisms often relate to species and activities covered and excluded from the AWA's protections, the nature of "minimum standards," agency enforcement, and licensing practices. Official AWA compliance records, in the form of inspection reports, are formally posted online for three years. Enforcement actions stemming from those inspections or other incidents are released to the public monthly. Animal groups (including the zoological community), the public, and the agency are increasingly moving toward greater protections for animals, in order to enhance their welfare—rather than simply providing humane care and treatment, and protecting "owners of animals from the theft of their animals," as was the case 50 years ago. Looking ahead, the AWA is likely to become a more important vehicle for animal protection and welfare. The zoological community needs to more fully embrace the importance of the AWA, and continue to more proactively engage the agency and others to leverage the AWA and advance animal welfare. This can be achieved by simple daily actions, raising standards—including best practices—as well as improving regulations. The training provided via the Academy, especially the Regulations and Inspection Readiness course, and the ideas shared in this column will make your organization "inspection-ready at all times," thus utilizing the AWA to better serve animals and your organization. Along with Excellence Beyond Compliance, Animal Welfare and other courses, and cutting-edge research like the recent landmark collaborative elephant welfare initiative are among the many good works helping the zoological community move forward as the AWA begins its second half-century. What are your and your organization's AWA compliance-related responsibilities? Who is your in-house authority on AWA requirements? If that person is unavailable, who is next up to provide guidance? Who is your in-house USDA APHIS Animal Care point of contact/responsible person? If he or she is unavailable, how do you contact your inspector? What is an Animal Welfare Officer (AWO)? If you do not have an AWO, does your organization have others with AWO-like responsibilities for enhancing animal welfare? Do you have an Animal Welfare Plan for any resident animals, species, or the entire resident animal population? What formal and informal research are you conducting, planning, or studying to enhance animal welfare throughout your organization? How robust are your initial, ongoing, or supplemental training efforts? Are there any gaps? If so, how can you best address them? Can you identify and list outside professional development activities for the previous and next year—individually, by team/department, and organizationwide? Are there any gaps? If so, how can you best address them? How are staff and volunteers encouraged and recognized for making constructive suggestions for improvement? How often? What are the best ideas presented in the past year? What do you, your colleagues and staff/organization do to prepare for and review USDA APHIS inspections? When did you, your colleagues and staff/organization last engage your inspector outside of an inspection? Why—or why not? How does your organization greet your inspector and begin inspections? Is there any briefing about recent changes, developments, and improvements, or request for guidance at the outset of inspections? Could you summarize the findings of your most recent APHIS inspection, as well as all of your organization's inspection reports posted online? Are there any patterns or lessons to be found from the inspection reports posted online? How often does your organization review, update and improve your forms, protocols, and policies? Is there a periodic assessment of organizational compliance with your own requirements? What changes, modifications, and enhancements has your organization enacted in response to high-profile incidents elsewhere in the zoological world over the last few years? Have you or your organization ever disagreed with the findings in an inspection report? How have you addressed such situations? Has the organization ever taken an inspection report appeal? If so, what was the result, and how might that be improved upon? Does your organization report to and update your inspector about post-inspection corrective measures or improvements? We look forward to seeing you at the AZA conference in San Diego, where we will proudly be joining the rest of the Academy team and also making some presentations. Last month, we looked at chlorine and chloramines, which are frequently added to tap water as disinfectants. Now, we'll look at their toxicity. Chlorine and chloramine are very damaging to gills. An acute toxic level will destroy gill epithelium and cause deaths. The proteins in the gill cell walls are damaged, and there is also internal damage to cellular components. 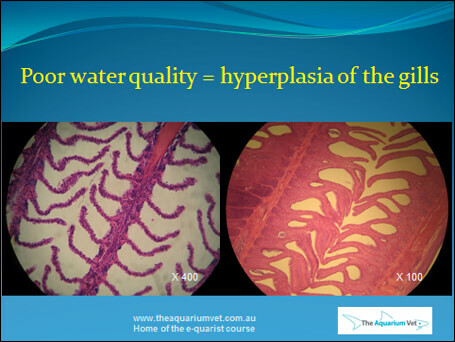 Low levels will cause a chronic branchitis (a long-standing inflammation of the gills) and hyperplasia (a thickening and scar tissue) of the gill epithelium. This will cause respiratory compromise. Fish are extremely sensitive to chlorine. With chlorine levels greater than 1.00 ppm, fish will succumb in hours, or even minutes. Exposure to chlorine can occur when untreated municipal water is added to a freshwater tank. Death can occur at 0.04 to 0.1 mg/L (ppm). Chlorine will usually be spontaneously removed from water within 24 to 48 hours, if it is allowed to stand. Aeration will expedite this process. Chloramines do not break down over a 24-hour period and gas off as chlorine does: they tend to persist longer. Filtration through activated carbon will remove chlorine and chloramines. Reaction with the carbon will produce carbon dioxide (CO2) and ammonium (NH4+) salts, which are far less toxic. Sodium thiosulphate (Na2S2O3) can also be used to neutralize chlorine. Testing of water to ensure that there is no chlorine—or that there are very low levels of chlorine—before any fish are placed in a system is always recommended, particularly after chlorination of a system or when using municipal water. The form that chlorine (Cl) takes in water can depend on temperature, pH, and the presence of ammonia-nitrogen, leading to the production of chloramines. Free Available Chlorine refers to the level of hypochlorous acid (HOCl) and hypochlorite ion (OCl ) present in the solution. The chloramines are referred to as Combined Available Chlorine. Total Chlorine is the sum of Free Available Chlorine and Combined Available Chlorine. Most tests to measure chlorine are called DPD tests, as they use a compound called N,N-Diethyl-p-PhenyleneDiamine. The DPD is oxidized by chlorine to produce a pink-to-magenta color, with the color intensity correlating with the chlorine level in the sample. DPD reacts similarly with other oxidants that may already be in the water, such as bromide (Br-) and iodide (I-). This mainly applies to seawater. It will similarly react with other oxidizing agents added as water treatments, which would include ozone, hydrogen peroxide (H2O2) and potassium permanganate (KMnO4). This needs to be taken into account when interpreting a chlorine test. When using a spectrophotometer, two tests are available that will measure the Free Available Chlorine and the Total Chlorine. By subtracting the Free Available Chlorine from the Total Chlorine reading, the Combined Available Chlorine level can be calculated. 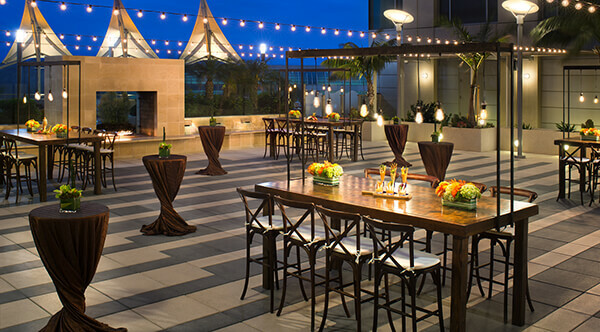 Next month, we will be in San Diego for the AZA conference—and we will have a booth. We would love for you to drop by and say g'day.